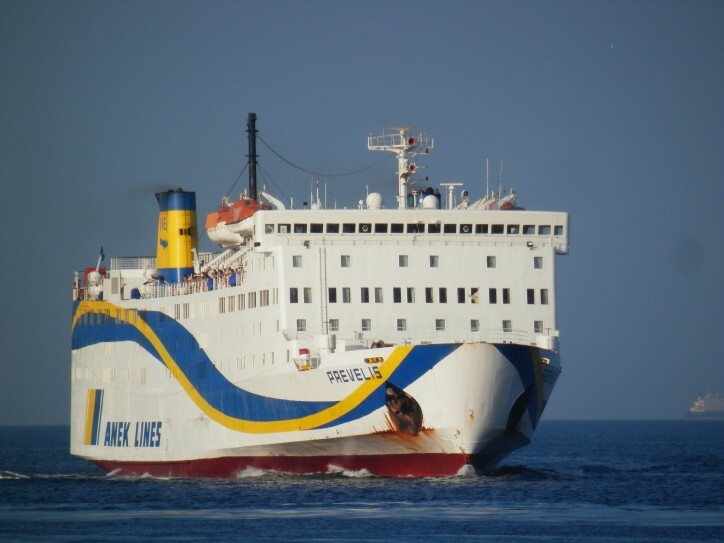 A passenger ferry owned by the Greek shipping company Anek Lines has been left with a small gash to its stern following an accident at the small Greek island of Anafi. The 15,354-gt Prevelis, built 1980, took a hit with portside stern as it was trying to dock at the port. Preliminary reports show that the most probable cause for the incident are wrong docking maneuvers with higher than the normal speed, which caused a small water ingress in the ballast tank. All passengers and vehicles onboard the ferry have been successfully offloaded and there were no reports for injured people. Anek Lines canceled the next voyage of the ship and all passengers will be transferred to another cruise line. Prevelis will stay in the Anafi port for repairing and will wait for permission, after an inspection from the local authorities, to continue its service operations. The 148 metres long Prevelis is 3,300 dwt Ro-Ro ship, built in 1980 by Japanese Imabari Shipbuilding and operated by the Greek company Anek Lines.